Competition between the many volunteer Fire Departments on Long Island can trace it’s history back to the late 1800’s when tournaments were held to display the firefighting skills of the volunteers using the equipment in use at that time. These would consist of ladder climbing and hose events that also included hand-drawn equipment and, of course, a ‘bucket brigade’. 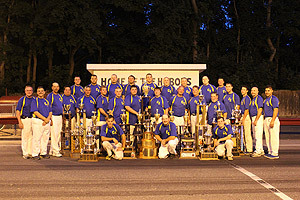 With the development of motorized vehicles, these contests evolved over many years to what is used today, but the ‘basics’ of these competitions echo back to an earlier time when each Drill Team strove to the ‘the best’ at that day’s tournament. 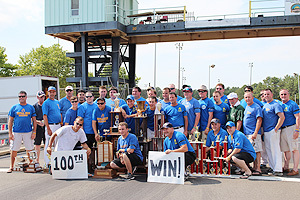 Central Islip’s earliest entry into these events took place in 1909 when the ‘Central Islip Fire Company’ voted to take place in the #1 and #2 contests to be held at the Annual Tournament in Southampton in September. There is no mention of the ‘Company’s’ performance in these two events in the minutes. 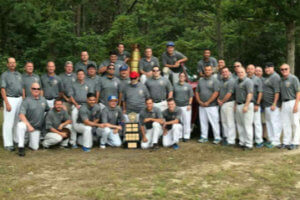 Central Islip also attended the Suffolk County Volunteer Firemen’s Association tournament in Sayville in 1910 with the Hook & Ladder and Chemical Engine (at the time, the Department’s only two pieces of equipment). This intermittent participation at tournament competition continued until finally on July 6, 1925, a ‘Racing Manager’ was appointed (although it was not stated who filled this position) with the following members joining our first organized ‘Running Team’ (as it was referred to): J. Arthur Mulligan, Henry Wolf, Sr., Bernard Simms, Thomas Cordingley, Alfred Wolf, Lynn Dickson, Louis Updyke, Harry Melton, Charles Mulligan, Thomas Nolan, James Nolan, Kyrle Skinner, Henry Martin, Thomas Shaughnessy, Wallace McCrone and Edward Gibson. Practice sessions were conducted on Church Street. 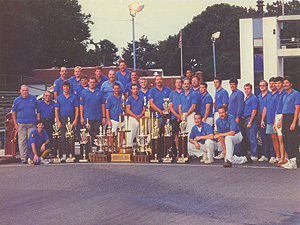 This Team participated in the Islip Town Volunteer Firemen’s Association tournament finishing 2nd in both the Efficiency and Chemical Engine contests – these two trophies are still on display at the Fire House and represent our earliest trophies for Drill Team competition. 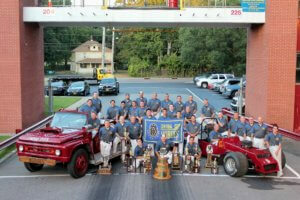 The Team took part in the Southern New York Drill at Islip in 1926 placing in six contests. Up to this time, regular apparatus was used for competition. Equipment stored on a pumper or other truck (such as the ‘Patrol Truck’) was removed for the day, the truck was used at the Drill, and the truck was restored for service when the Drill was over. In 1929, William Kirschnik donated a truck for racing purposes to the ‘Hose Company’ for the Department to maintain and compete in tournaments. There is no description of this vehicle and no photo in the records. This year (1929) is also the Team’s first entry into a New York State Drill which was held in Saranac Lake – 11 members participated. Team Captain Robert Groth suggested in 1937 that the Team have a nickname, as did most other Drill Teams. A contest was held on a Department level for possible names with the winner to receive a prize of $5.00. Ex-Chief J. Arthur Mulligan choice of the “Golden Arrows” was decided as the best entry and the Team used this name through the 1940’s. At this time, the Department purchased ‘racing suits’ for use at tournaments. One of these suits is on display at Headquarters, having belonged to long time Team member, Reggie Miller. The Team purchased a new 1961 Ford F-500 ‘B’ Truck in April of this year and it was ready for the start of that season in June. This truck remains in service today. 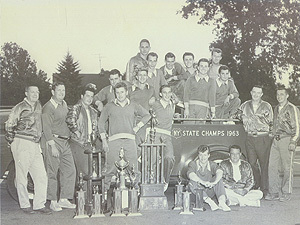 Many years of dedication and hard work were realized when the “Hoboes” captured their first tournament victory by winning the Islip Town VFA Drill in West Sayville in July of 1961. It was the first of many subsequent Championships on many levels (Town, County, State, etc.). The Team re-organized in 1962 creating the positions of President and Vice-President. The Captain and two Lieutenants were to take care of the preparation of the team for competition on the track, and the new Executive Officers were to handle the business portion of the Team’s activities. The Arch and Track at Station #2 on Wheeler Road was completed in August of 1962 and became the site of over 100 Drills on various levels (over 75 motorized) including Juniors’ competitions. The first Parade and Drill sponsored by the Central Islip F.D. was held at this facility on August 3, 1963, with the Drill being won by the “Hoboes”. The Team was directed to remove the wooden arches at Wilson Blvd. and Cinnamon Street and next to the Fire House in 1963 as they were no longer needed. 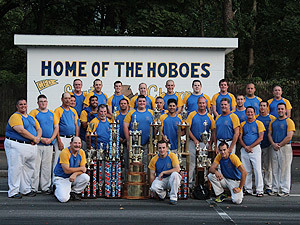 The “Hoboes” achieved the ultimate distinction of capturing the first of their six New York State Championships on August 22, 1963 being crowned as ‘State Champions’ at the Drill held in Niagara Falls. A new building for the Team was constructed in 1968 to the rear of Station #2 – this is referred to as Station #2 ½, or simply as “The Shack”. Up to this time, the Team operated out of Station #2 where they had a locker room facility and where the 2 trucks were stored. 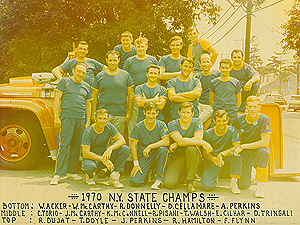 The Team won its’ 2nd State Championship at Watertown on August 15, 1970. A new custom ‘C’ Truck was added in 1975 replacing the 1965 Dodge Coronet and it participated in its’ first drill at the Islip Town VFA Drill held in Bayport. 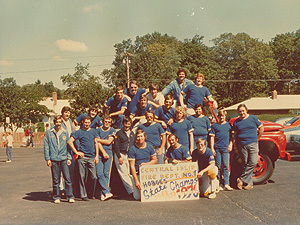 The third State Championship was won, again at Watertown, on August 21, 1976 and the fourth at Hempstead on August 26, 1978. This was an especially distinct victory as it marks the only time in State Championship history that a Team has won without the use of a ‘C’ Truck. This was due to the fact that the engine was rendered completely out of service during a test run the night before the Drill. The Team placed in all 8 contests in one Drill for the first time at the Southern New York Drill held at Mineola in 1979, and scored the most points by a “Hoboes” Team with 36 points at Suffolk/Nassau Invitational at Central Islip in 2013. 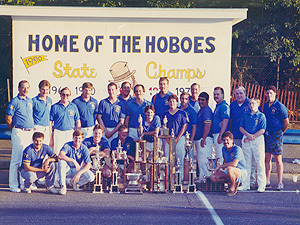 The fifth State Championship for the “Hoboes” came on August 19, 1990 at Main-Transit (Buffalo) and the sixth at Hempstead on August 14, 1993. The seventh State Championship came in 2010 with the team winning in Clayton, NY, eighth State Championship in 2013 at Hempstead NY, ninth State Championship in 2014 at Deerfield, NY., tenth State Championship in 2015 at Ridge tying with the West Sayville Flying Dutchman, and the 11th State Championship in 2017 at Hempstead. An impressive performance in the Efficiency Contest in 2002 resulted with first place finishes in all 8 recognized Suffolk County Drills for the year, with the Team scoring 40 out of 40 possible points. This is the first time that any Suffolk County Team has accomplished this feat for any one contest in any one year. 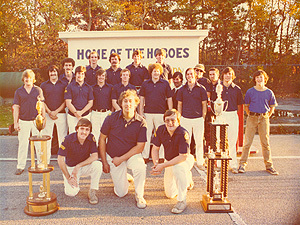 The Drill Team has been an important part of the Department in its’ over 80 year existence whether known as the “Running Team”, “Golden Arrows” or “Hoboes”. 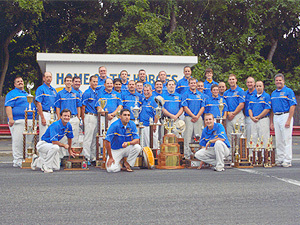 Many members have passed through its’ ranks over the years in an effort to represent the Department in competition against other Teams. All have worked to do their best at all times, and all have memories of their time on the Team and of friendships developed with Team members and with members of other Fire Departments. In many cases, these friendships have lasted for lifetimes.